SEP, Ottobrunn LOx/LH2 rocket engine. In development. New generator cycle rocket engine for an Ariane 5 core stage upgrade. Thrust increased more than 30% from Vulcain 1. First flight 2002. Status: In development. Number: 9 . Thrust: 1,350.00 kN (303,490 lbf). Unfuelled mass: 1,800 kg (3,900 lb). Specific impulse: 434 s. Specific impulse sea level: 318 s. Height: 3.60 m (11.80 ft). Diameter: 2.10 m (6.80 ft). By making design enhancements to the Vulcain 1 engine and introducing innovative production technologies, the thrust of Vulcain 2 was increased to 135 metric tons - an increase of more than 30% compared to its predecessor. Vulcain 2 would increase the payload capacity of Ariane 5 to 6.8 metric tons and increase the engine's specific impulse by 3 seconds over the basic model. This was achieved by increasing the O:F ratio to 6.3, increasing the expansion ratio by 30%, and exhausting turbine gases into the exit cone of the engine. Seven Vulcan-2 were built for running at test stand P5 in Lampoldshausen and PF50 at Vernon between April 30, 1999 and the end of 2001. 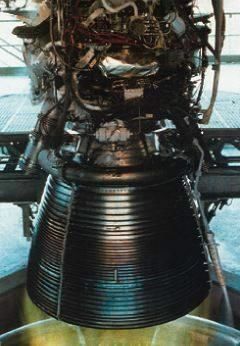 As with Vulcain 1, the Ottobrunn facility was responsible for the development and manufacture of the Vulcain 2 thrust chamber comprising the regeneratively cooled combustion chamber, coaxial propellant mixing injectors, dump cooled nozzle extension, and gimbal joint. Thrust (sl): 939.500 kN (211,208 lbf). Thrust (sl): 95,807 kgf. Engine: 811 kg (1,787 lb). Chamber Pressure: 116.00 bar. Area Ratio: 61.5. Thrust to Weight Ratio: 73.6461709372948. Oxidizer to Fuel Ratio: 6.7. Coefficient of Thrust vacuum: 1.96469483389405. Coefficient of Thrust sea level: 1.43452242010095. Country: France. Propellants: Lox/LH2. Stages: Ariane 5-1 EPC. Agency: Ottobrunn. Bibliography: 225, 7574.